Using sustainable natural resources to create new and innovative art – with passion. We have created a wide variety of beautiful sculptures for different commercial enterprises. Our bespoke sculptures have been a great addition to international fashion houses, well-known pub chains, retail villages and garden estates. We work closely with your team to ensure your sculpture meets your brief and you are able to display a unique work of art for your customers, specifically created for your business. 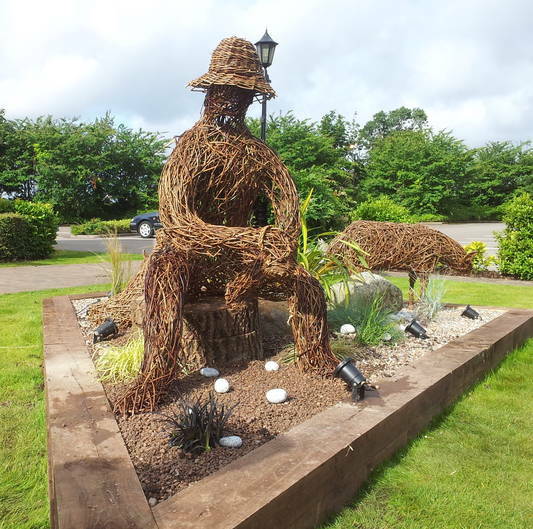 Our work over the last decade has included works of art such as; an archer for a garden designed as a target, a giant willow otter for a pub named The Otter and a family shopping for a retail village. If you would be interested in discussing your idea for a sculpture with our team, you can contact using the form below. You dream, we create. Redstone Willows. All Copyright 2016.